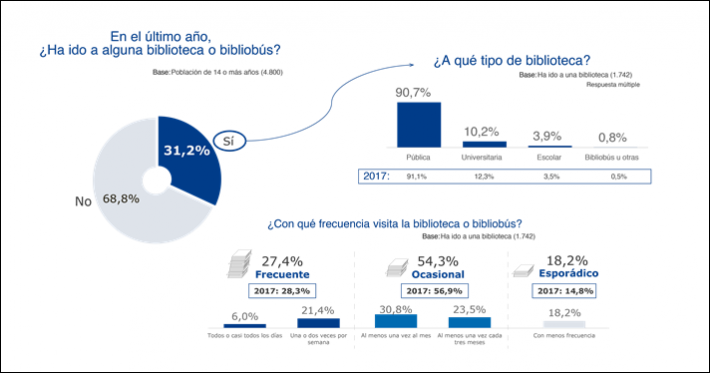 The new ‘barometer’ report on reading habits in Spain for 2018 shows a growing engagement with readership, older teens reading less. 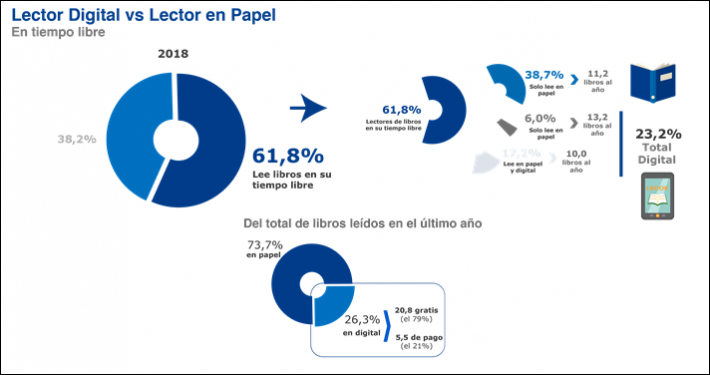 Iannouncing results today (January 22) of its new “Barometer of Reading Habits” study for 2018, the Federación de Gremios de Editores de España (Federation of Spanish Publishers’ Guilds) is cheering one finding that 67.2 percent of Spain’s population report having read books in 2018. That figure, the federation reports, is an increase of 1.4 percent over 2017’s figure. The survey from which today’s data is derived is a study sponsored by the directorate-general of books and reading in the ministry of culture and sports, and was conducted with a sample of 5,000 respondents by Conecta Research & Consulting. 44.5 percent of readers surveyed reported that they read regularly or occasionally in two or more languages: 21.3 percent usually read in English, 20.3 percent in Catalan / Valencian, and 4.2 percent in French. 92.4 percent of the population reported it reads in the Castilian language. A growing number of readers, skewing somewhat younger than committed print readers, reported that they read in digital formats. This group accounts for 23.2 percent of respondents, with 6 percent saying they read only digital and 17.2 percent saying they read in both formats. Digital readers are being described by the federation as more “intensive,” reporting that a digital reader will read 13.2 books per year, compared to 11.2 books for a print-only reader. Digital readers reported that their personal libraries have 269 books on average compared to the 230 books for print readers. 79 percent of digital books read in the past year were obtained without paying for them: only 21 percent of respondents’ digital books were said to have been purchased. 2.5 percent of the survey population aged 14 or older said they listen to audiobooks at least quarterly. 1.1 percent of audiobook listeners said they listen to an audiobook at least once per week. Reading among children was seen as widespread up to age 14, after which a decline is seen both in reading and in library usage. Readers consider their love for reading began at age 15. The number of self-described book buyers rose to 62.4 percent over 61 percent in 2017. Self-described book buyers reported purchasing an average of 10.3 in 2018, up from 9.4 books in 2017. The public library service drew an 8.1-percent approval rating, but the lending service saw some decline in 2018. Women accounted for 67.2 percent of leisure readers, with men coming in at 56.2 percent—roughly an 11-percent gender gap. Men, the research indicates, are more readers of newspapers, comics and websites, blogs and forums, by comparison to women, the study researchers say. And that sort of difference was most evident in the 25-to-39 age group, demonstrating some 15.9 percent difference between book-reading women and media-reading men. In questions on respondents’ attitudes about reading, reading women said they see reading as an “exciting and stimulating activity that makes you happier.” Men said they saw other leisure activities as more exciting, and that reading books isn’t required to have a cultured lifestyle. The study found that teenagers 15 to 18 said they read some 33 percent of their books in digital formats. For younger children, aged 10 to 14 years, the percentage of digital reads climbs to 37.6 percent. In overall reading—meaning both for pleasure and for school work—86.7 percent children 10 to 14 reported that they’re reading. In the 15-to-18 age group, that figure fell to 75.8 percent. Madrid, Basque Country and La Rioja were the regions with the highest percentage of buyers of non-textbooks. 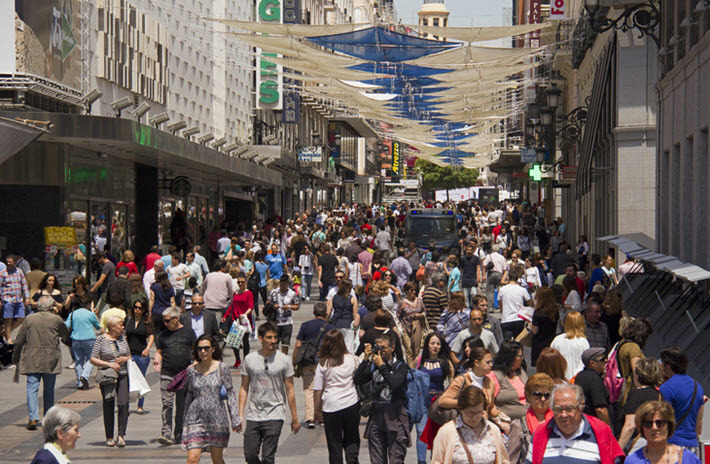 Cantabria and Valencia were the communities with the highest average numbers of purchased books, at 10.5 and 9.2 books per capita respectively. The Canaries and Castilla y León are remain communities with the lowest percentages of buyers. Castilla-La Mancha is the community in which the fewest books on average (5.9 per person) were purchased.